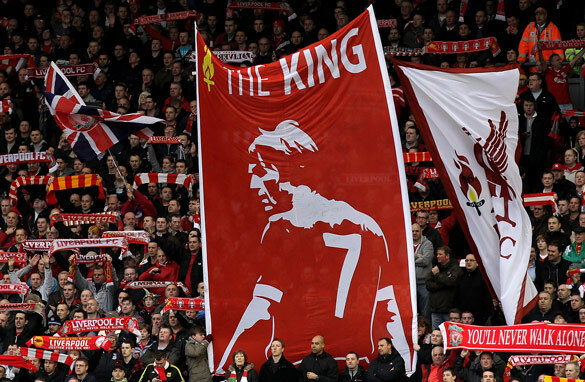 Should King Kenny come back for good? Kenny Dalglish is revered by the Liverpool fans who sit on The Kop at Anfield. Okay Liverpool FC it’s time. Caretaker manager Kenny Dalglish deserves to be handed a nice meaty contract now! What more must the King do? Having taken over from the unpopular Roy Hodgson (who’s since done very well at West Brom) Dalglish has secured 27 points from 14 league games -– and for a considerable amount of that time he’s been without influential captain Steven Gerrard. The Kop loves him, fans all around the world love him and it’s obvious his players love him too. I saw that first hand at Anfield in March when the Reds crushed arch-rivals Manchester United 3-1. I must say, I quite enjoyed that victory! Recently, even Sir Alex Ferguson said that Liverpool will be in the reckoning next season and as Kenny rightly said, Fergie is not often wrong. Take a look at the teamsheet for the 5-0 win over Birmingham and you’ll see Flanagan, Robinson, Shelvy, Spearing and Coady -– names really only familiar to Liverpool supporters. And these are just some of the youngsters who have either been brought through the terrific academy, or signed from other clubs before they got too expensive. There are also 16-year-olds Raheem Sterling and Adam Morgan to get excited about, plus a whole host of others. Former manager Rafael Benitez must be credited for the Academy’s resurgence, but it’s Dalglish who’s had the foresight and guts to use these young men and show them that they have a future at Liverpool. At other clubs these players are often sold on with the money spent to buy experienced talent -– but surely Liverpool’s way is the way of the future. New owners Fenway Sports Group seem to be right behind Kenny. There is money there if he wants to buy -– as he did in January when Suarez and Carroll came in – but it’s not a Manchester City-type situation and the majority of Liverpool fans must surely be glad about that. Who doesn’t want to see home-grown talent come through? It’s a lot more exciting knowing that these boys could be the next Gerrard, Carragher or even Owen. And good on Dalglish for bringing them to our attention. The future at Anfield is bright and King Kenny must be in charge, permanently! Is there any reason why he shouldn't? I see no reason why King Kenny shouldn't be hired as Liverpool's manager permanently. He has done great wonders since he took the throne. Hi Candy – I totally agree that Dalgleish should be handed the reins as soon as possible. Who else at this point of time could replace him? It is also very encouraging that so many youngsters are coming through. I hope there are young defenderd coming through especially as tis the area where Liverpool are weakest and need new blood. All in all, great job Kenny – let's hope for a successful future! The king has nothing else to prove that is the man for the job ,that he can take liverpool to where they where. King Kenny Is an Absolute must to stay on as manager.The Guy is a legend to anyone associated with LFC and Football in general. What he has done in 4 months is amazing,the players look hungry, and that they actually care, and the youth coming through is something all of us fans should be excited by. Still think we need 2 or 3 more class signings in the summer and we'll be all good for a real go at the title next year.Just hope we dont get Europa league as I really think its a joke and would harm our league form.Playing thursday then sunday not good as we be playing catch up all year. God Save the King. Long live Liverpool. Good comments Candy. Spot on. The Fenway Group deserves kudos but Dalglish has ignited the fire. As usual, Candy Reid has it right. He deserves a contract but not at Liverpool, another more deserving club where there's a chance of silverware. King Kenny has done very well. Long live King Kenny. its good that the king is there and our confidence is back the youth is our future.long live king kenny ,long live liverpool .we are going all the way back to the glory days. Listen mal cat Liverpool's glory days are done, move on, switch teams, Man U are the best. Congratulations to FSG 4 granting KK a 3 year contract,it was absolutely the right thing to do .King Kenny owes it to all REDS/KOPITES to resurrect the fortunes the sleeping Merseyside Giants having last won the EPL Crown in 1990.It really hurts all KOPS to see the the fierce NW Enemy of 36 miles Man Utd eventually eclipse the record 18EPL Championships LPL FC jointly held with them.KK shldnt have prematurely thrown in the towel in April 1991 with Liverpool on top, 3 pts ahead of Arsenal ,who knows if he had stayed on until the end ,LVPL FC wld have one the league.Gerrard Houiller shld have at least won one EPL Crown in his 6year tenure,Rafael Benitez too shld have at least won the EPL title in2009 in his 6 year tenure at Anfield.KK certainly knows how to to win the EPL Crown having down it with both Blackburn `95 & mighty Liverpool in 1986,88,90.